“They used Golden Gloves as a jumpstart to professional careers,” Botti says. Herkin DeLaRosa, 20, of Union City, has 26 fights under his belt and sees a Golden Gloves title as his opportunity to go pro. 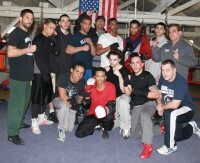 DeLaRosa is one of ten boxers at the Union City Gym who will be competing in the 2012 New Jersey Golden Gloves amateur boxing championship’s preliminaries for a shot at the nationals. The team also includes Felix Tejada, Jose Aviles and Johnny Hernandez of Union City; William Arevalo, Anthony Valentini, Jarrett Blair and Gino Montero of Jersey City; Carlos Lopez of North Bergen; and Hector Melendez of Hoboken. Melendez, 17, has won 20 fights and two Diamond Glove championships. He also takes AP classes at Hoboken High School and plans to major in economics in college. Melendez also has high praises for his trainer.